Chief John Tedesco briefs reporters as Mayor Lou Rosamilia looks on. When officers Chad Klein and Joshua Comitale responded to a report of a carjacking, they encountered 39-year-old Thaddeus Faison of Albany, who fired upon them as they approached. 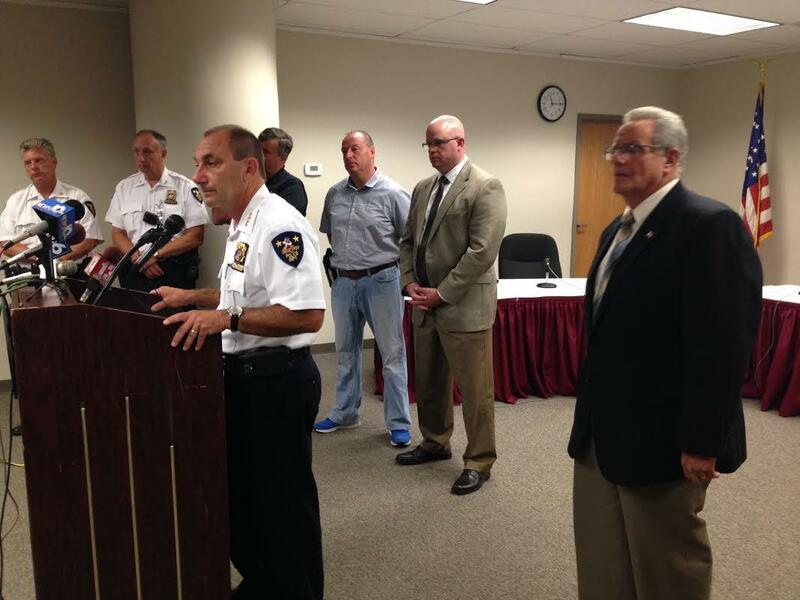 Police Chief John Tedesco spoke at City Hall on Sunday. "Officer Comitale radioed for assistance. He then followed the suspect, first in the patrol vehicle, and then on foot. As he was doing so, the suspect started to pick up his speed into a run. Office Comitale continued the pursuit. At that time Office Jack Klein was responding to assist. Came up 112th St., turned on to, or tuned onto 112th street from 5th Avenue, where he ran into the suspect and was shot at point blank range. The bullet hit him in the back of the shoulder. Office Klein then turned his vehicle around, exited the vehicle..."
Comitale radioed emergency responders the location where he was taking cover. For a moment Klein apparently lost contact with headquarters. The police radio crackled "112 and 5. We're in a co-ordinated search for Officer Klein. Traffic center, I want you to ask every hospital, we're looking for another officer, Officer Klein." Tedesco adds "While this was going on, the suspect engaged Officer Comitale who was across the street. Multiple rounds were exchanged. Officer Comitale was shot in both legs." Mayor Lou Rosamilia says both officers were rescued and taken to Albany Medical Center. "And I had the opportunity to actually go down to the hospital after and visit with them, and meet with their families, and speak with them." Tedesco says Faison was shot several times, and continued to resist, despite the attempts of four officers to restrain him. He was then tazed and eventually taken to the hospital, where he was pronounced dead. "He has a very violent criminal past. Multiple charges for weapons possession and had done time in state prison. He was a parolee." Friends of Faison, who was NOT on parole but free having served his time, told the Times Union police are portraying the "family man" they affectionately knew as "T.O." as a villain. They say Faison was a dedicated father who a few hours before the shootout was at the supermarket buying formula for his 8-month-old twins. Rensselaer County D.A. Joel Abelove says because Faison was armed, the shooting does not fall under the recent executive order from Governor Andrew Cuomo empowering Attorney General Eric Schneiderman to review police-citizen encounters that end in a civilian death. Chief Tedesco stands by his men: "Officer Klein is a veteran of the Gulf War. Married with several children. He works the afternoon shift on patrol. Very well regarded by all his comrades. Officer Comitale currently serves on patrol also. He's an evidence technician. He's a member of the SWAT team. A very capable officer. He has a lot of interests that have served the department very well. So they're both two young upcomers in the department." Klein and Comitale are expected to recover. Attorney General Eric Schneiderman on Tuesday revealed indictments against 20 alleged members and associates of a Troy-based gang (including an ex-Watervliet police officer) on charges they operated a high-volume drug trafficking ring. Nearly 300 people rallied in Albany's Washington Park Saturday, at the culmination of "A Walk To Cure Violence." The city has seen a spike in shootings this year.